IntelliJ IDEA is a fantastic IDE, much better than any other IDE I've used in the past. It's my IDE of choice for most of my professional development work so I use it on quite a regular basis. A really cool feature it has is that it's possible to run the OS shell in a Terminal tab. The default colour scheme of course sets the background to white and foreground to black, not very Terminal-like. This is how you can get the Terminal tab looking like it should. Changing these colours is easy. 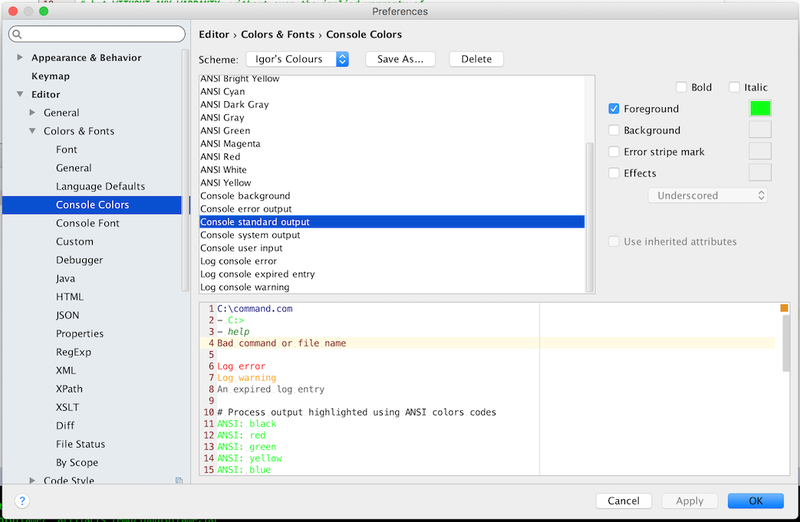 In the Preferences, go to Editor > Colors & Fonts > Console. Then set the 'Console background' to Black. After that set the 'Console standard output' to a bright green colour (or orange if you're feeling really nostalgic). To save, click OK. You'll probably notice nothing has changed, this happened to me too. I had to close the Terminal tab (by clicking its X button) and after I've opened it again, it had the new colours set properly. I know the Darcula scheme exists, but personally I do not like a dark background for code editing, but if you do, that scheme will change your Terminal colours as well.